Taste test: These taste just like regular Ruffles — that is, the old type of Ruffles with the tight ridges, before Ruffles widened their ridges to make them look more like Wavy Lay's. 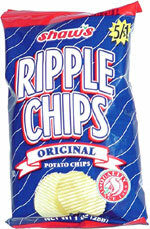 We tried these with dip, and they kept breaking, so you have to make sure you're pointing the chip in the right direction so as to not break them. Smell test: Regular potato chip smell. From the package: There are two recipes, one for clam dip and one for Zesty Italian dip. 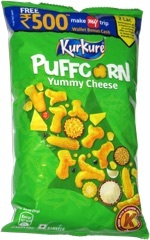 This snack was discovered by Keith at Star Market, Stow, Massachusetts.